A couple of weekends ago (July 11, 2009) we attended a wedding for Monique’s best friend Cheryl’s daughter in Fredericksburg, VA, it was held on Saturday. The next day Cheryl and Julius had a get together of mostly family and a few friends including Monique, Ben and myself. They invited us for some jambalaya and it turns out Julius decided to make a huge batch with some sausage and chicken in his outdoor cast iron “King Kooker” kettle and propane burner. 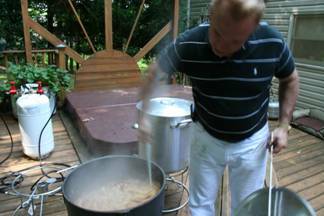 He used 10 boxes of the family size Zatarain’s Jambalaya mix along with about 10 pounds of sliced sausage and 10 pounds of cubed chicken. The jambalaya was a great treat, very tasty and delicious. What was really amazing was that I also had my Zatarain’s Jambalaya Throwdown Kit contest running at the same time. Before the jambalaya was ready to eat Julius also made up a batch of some jalapeno poppers and we just about devoured them as quick as we could. It was an amazing day of visiting with old friends that really seem like family too. And getting to eat some good ole jambalaya in Virginia just about like it is done in Louisiana was a real treat, it took us back in time and we felt like we were back in our home town of New Orleans…good times for sure, and a perfect Jambalaya Throwdown too! We got back home late Sunday evening and then on Monday after work we made a trip to the local grocery, I asked Ben if he wanted to make some of those jalapeno poppers and that’s when some more excitement started. At the store we got 15 fresh jalapenos, 2 pounds of sliced bacon, 30 medium shrimp and 1 pound of cream cheese, along with some of our regular staples and such. I wasn’t sure how much cream cheese and bacon I would need so I bought extra just in case. Upon our return from the store we immediately started prepping for the poppers. While I cut and de-seeded the jalapenos Ben peeled the shrimp and I let the cream cheese soften up a bit. Once the shrimp were done I tossed a little of my “Finger Lickin’ Rub” spice mix on them and let em sit for a bit to marinate. What follows is a very close version of the poppers that Julius made on that fantastic day, and recreated just one day later in our kitchen. 1. 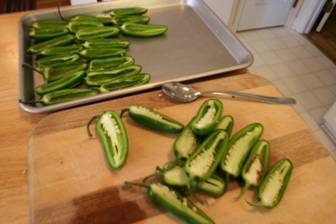 To prepare the jalapenos cut them in half lengthwise and then scoop out and discard the seeds. Line them on a lightly greased sheet pan. 2. In the meantime peel the shrimp and toss with the rub spice mix and set aside. 3. Fill each jalapeno shell with the cream cheese to the top. 4. 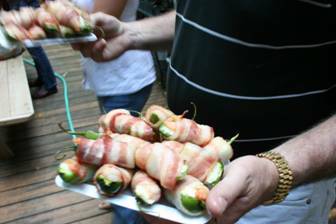 Top each stuffed jalapeno with one of the seasoned shrimp. 5. 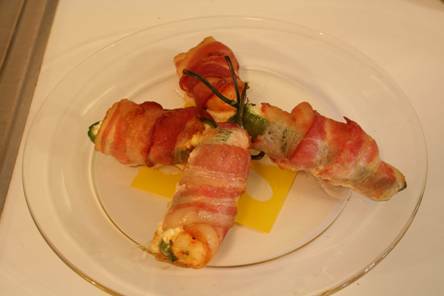 Taking a single slice of bacon wrap it around the entire jalapeno and shrimp, covering most of the jalapeno with the exception of the stem. 6. 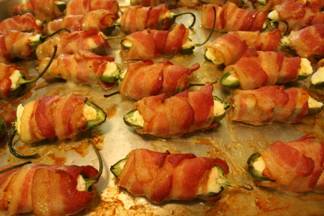 Place the stuffed and wrapped jalapenos on the sheet pan and roast in the oven for 25-30 minutes, or until the bacon is crispy and browned. Serve immediately. An appetizer that I’d adore, really appealing! Yes, please! These are just what I’m craving! Thank you for sharing. You made them look simply delicious ! Yummy ! Cheers ! These look delicious! I absolutely LOVE jalapeno poppers. Love the bacon wrap! Great stuff, love to make them all the time. YUMMY. I could so eat these! Oh these look so good! Yum! I adore these peppers. Generally have the pickle version of jalapeno peppers, but this one also sounds so tempting. The fresh peppers make the difference and hold up well in the oven.